The compact plants BioFix 1 and BioFix 2 consist of two interconnected underground plastic tanks, the first of which is a primary sedimentation tank, and the second a three-chamber bioreactor with a secondary sedimentation section. The treatment is either two- or three-stage. In a two-stage plant (BioFix B) the wastewater is treated mechanically and biologically, and in a three-stage plant (BioFix K) chemical treatment is added. Large impurities and suspended matter are detained in the primary sedimentation tank, having a capacity of 1 m3. This tank is equipped with a sieve, which prevents large impurities from reaching the bioreactor. The tank contains a pump chamber from which the mechanically treated water is pumped to the bioreactor. 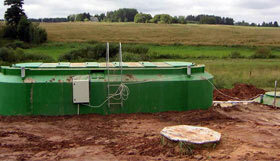 The biological treatment is carried out in the bioreactor, in which aerated (submerged) biofilter technology is used. The support media of the bioreactor consists of special plastic blocks with a large specific surface (200 m2/m3). The bioreactor is divided into three aeration chambers, into which a specific for this purification method biotic community develops. Small-bubble diffusers are used, compressed air being supplied by a small blower. In one of the sections of the bioreactor a secondary clarifier is situated, in which phosphorus is also removed. The precipitation chemical is dosed into a flocculation tube and the floc settle in the secondary clarifier, from which the sludge is automatically pumped to the primary sedimentation tank. The amount of sludge is very low, due to the special characteristics of aerated biofilter technology. The entire treatment process runs fully automatically. The technical equipment (automation and electrical devices, air blower and chemical dosing device) is fitted into a special service chamber. The installation of the fully equipped package plant can be performed easily, quickly and inexpensively. For normal performance of the treatment plant the temperature of wastewater should be at least 10 °C. If it is cooler, the biological process slows down and stops completely below 3 °C. To avoid hydraulic overloading and cooling down of the wastewater, drainage and precipitation water should not be allowed to enter the treatment plant. For accelerating the decomposition of organic matter as well as reducing the volume of sludge, adding of a special biological preparation (which may be obtained from the plant supplier) to the primary sedimentation tank is recommended. If the biological preparation is used, sludge is to be removed 1 to 2 times a year instead of the usual 2 to 4 times. As concerns organic matter (BOD7), suspended solids and phosphorus, the efficiency of properly run treatment plants is 90–99%, which is in compliance with legal requirements. Simultaneously with biological treatment nitrification and denitrification take place, as a result of which the nitrogen content of wastewater may be reduced (if the temperature of wastewater is at least 12 oC) up to 70 %. Reoveepuhastid BioFix 1 ja BioFix 2 on ette nähtud väikeobjektide reovee puhastamiseks, peamised kasutuskohad on eramud, suvilad ja paarismajad. COD – 94%, BOD – 99%, SS – 90%, Ptot – 91% and Ntot – 46%. Testing according to the procedure set out in EN 12566-3: 2005 proved that the treatment efficiency of the small wastewater treatment plant BioFix 1 is excellent and that it meets the requirements applied in many countries, including Finland where the requirements are one of the toughest in Europe.